The Yard Machine Snow Thrower H65FH comes with a powerful 357 cc engine that has been winterized for the toughest winters. 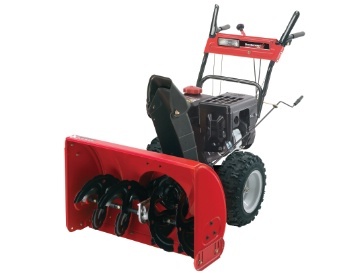 Combined with a 30 inch clearing width and a 21 inch high intake, operators will make short work of just about any snow in your driveway and yard. There are 6 forward and two reverse gears and the Yard Machine Snow Thrower H65FH sports 16 inch snow hog tires with heavy duty treads to give you maximum traction in most snow conditions. Add tire chains if you need that extra bit of traction, particularly in icy conditions. The Yard Machine Snow Thrower H65FH comes with a number of accessories that can be purchased with the snow thrower. The snow cab is particularly useful if you have a lot of wind which will blow the snow around or worse back in your face. Protect yourself with the snow cover on 3 sides. Customers can also protect their snow thrower with a snow cover from UV radiation as well as wind, snow and rain. Keep your Yard Machine Snow Thrower H65FH in excellent condition even if you have to store it outside all year round. The Yard Machine Snow Thrower H65FH also has a large number of features which operators may enjoy. The engine can be started electrically or by manual start. You can operate and steer the snow thrower with one hand while adjusting the snow chute to throw the snow in any direction. If you need to clear your driveway of snow at night, there is a in dash light to provide additional visibility for you to see your way. The handles fold for easy storage in tight places and The Yard Machine Snow Thrower H65FH comes with extra sheer bolts and the engine is filled with oil when it arrives. Sheer bolts are used to prevent damage to the auger if you were to hit something with the auger that prevents them from turning. They are easily replaced and you should always have some on hand. The Yard Machine Snow Thrower H65FH comes with a 2 year limited warranty as well. The Yard Machine Snow Thrower H65FH can be purchased at the following stores : AJ Walker, Canadian Tire, Castle Building Centers Group Ltd, Central supplies, CO-OP Atlantic,Cooperative Federee de Quebec, Federarted Co-operatives Limited, Copps buildall, Country Digest, FS, Do-it Center, Groupe BNR Inc., Home Hardware Stores Ltd, Piercys, Pro-Hardware, Kent Building Materials, Laferte, Lowe’s, Materieaux Laurentions, McDiarmid Lumber, Patrick Morin, Peavy Mart, Potvin & Bouchard Inc., Reno Depot Inc., Rona, Sodisco- Howden, Tim-BR Mart, Truserv, TSC Stores, and UFA. Many of the these stores will also arrange for delivery of the Yard Machine Snow Thrower H65FH for a delivery charge, however consumers can also pick up their machines as well at these stores and save on the delivery fee. Snow Cab – assembles in a few minutes and protects the operator from blowing snow and wind. The vinyl is freeze resistant and rip resistant woven polyethylene . Closed on three sides the snow cab provides excellent protection for the operator while blowing snow. Snow Cover – protect your Yard Machine Snow Thrower H65FH from the elements with the deluxe snow cover. Whether you store your snow thrower inside or out, the snow cover will protect your machine from UV radiation and natures elements. It is UV treated and mildew and rot resistant. Snow Tire Chains – provide extra traction on icy surfaces. With a zig zag design, tire chains can make a huge difference when conditions are icy and difficult to find traction. Poly Slide Shoes – can be purchased separately to replace existing shoes. Online Reviews: There were no online review provided by the manufacturer’s web site. The Yard Machine Snow Thrower H65FH is similar to most snow throwers. Operated safely it will be a great machine that does the job for you, efficiently and easily. Before operating the snow thrower for the first time, read the manual and note all safety guidelines and operating procedures. Following these guidelines will help you avoid any accidents and damage to the snow thrower or to objects around you. Prior to operating the first time each day, always check the engine oil and top up if needed. Fill the fuel tank while the engine is cool and to avoid running out while blowing snow. Try to only fill the fuel tank when the engine is cool and always turned off. If you do spill fuel, wait until it has evaporated before starting the engine to avoid the possibility of fire. When blow snow with the Yard Machine Snow Thrower H65FH always point the chute away from other people, the house and cars or other objects that could be damaged by icy projectiles that are sometimes picked up and blown at great speed from the chute. Maintenance of the Yard Machine Snow Thrower H65FH is relatively simple. Follow the guidelines outlined in the manual and monitor the Yard Machine Snow Thrower H65FH for loose parts and any abnormal operation. Repair or fix any problems you find to avoid further damage. Change the oil on a regular basis following the guidelines in the manual and change the oil a minimum of once per season to protect your engine.